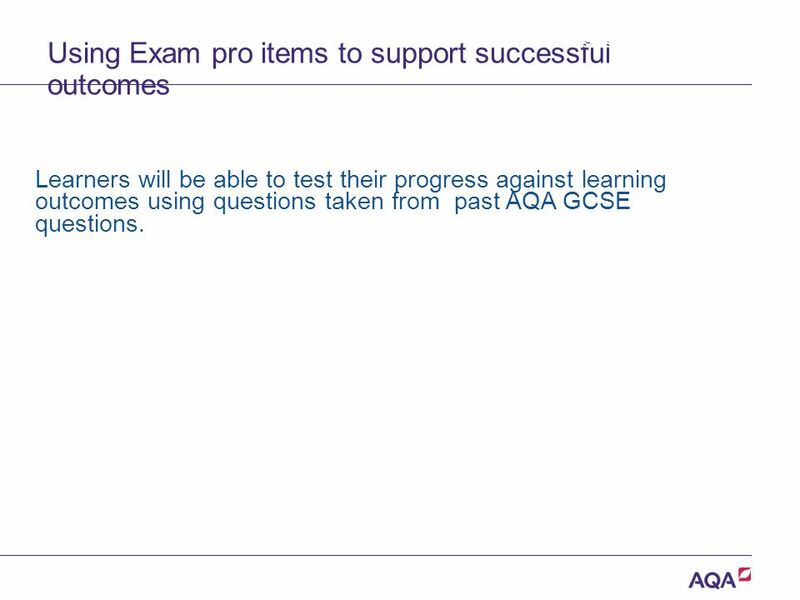 2 Using Exam pro items to support successful outcomes Learners will be able to test their progress against learning outcomes using questions taken from past AQA GCSE questions. 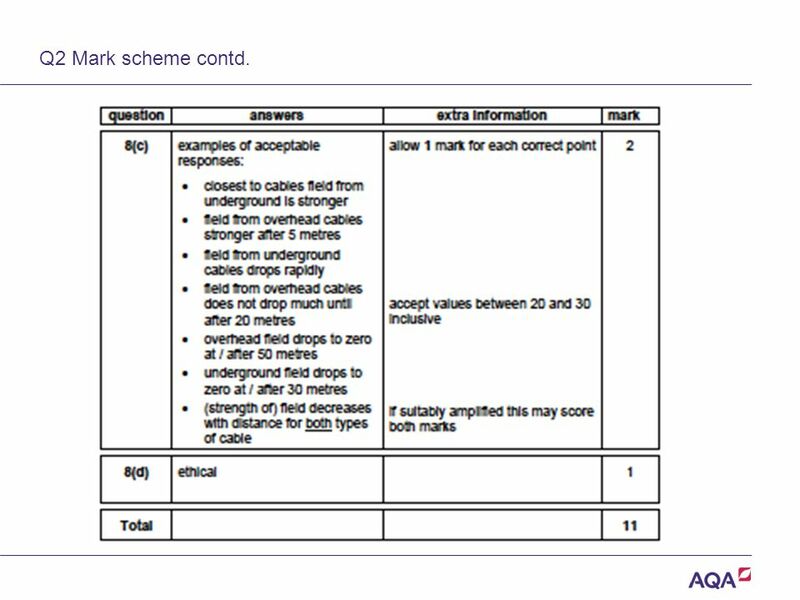 Assessment of practical work Version 2.0 Copyright © AQA and its licensors. All rights reserved. 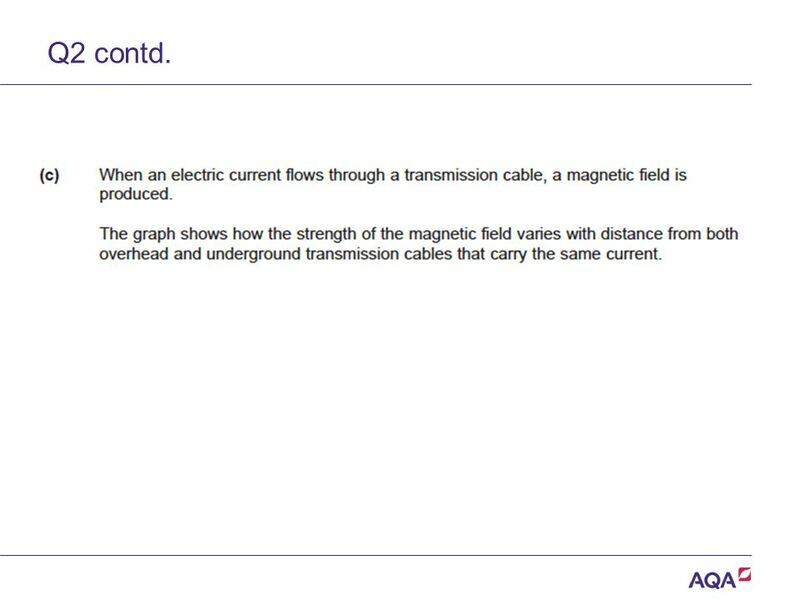 3 Q1 foundation AQA-PH1FP-QP-Jun12 Q5 Version 2.0 Copyright © AQA and its licensors. All rights reserved. 4 Q1 contd. Version 2.0 Copyright © AQA and its licensors. All rights reserved. 5 Q1 contd. Version 2.0 Copyright © AQA and its licensors. All rights reserved. 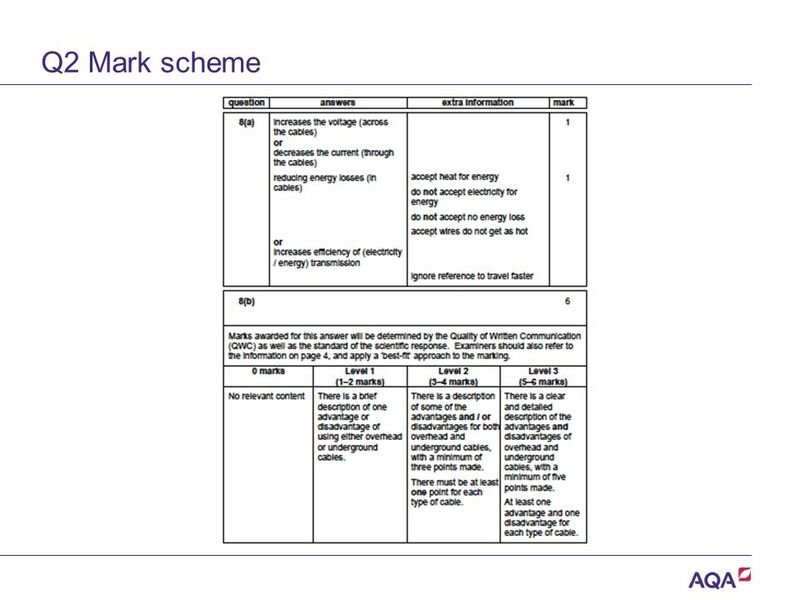 6 Q1 mark scheme Version 2.0 Copyright © AQA and its licensors. All rights reserved. 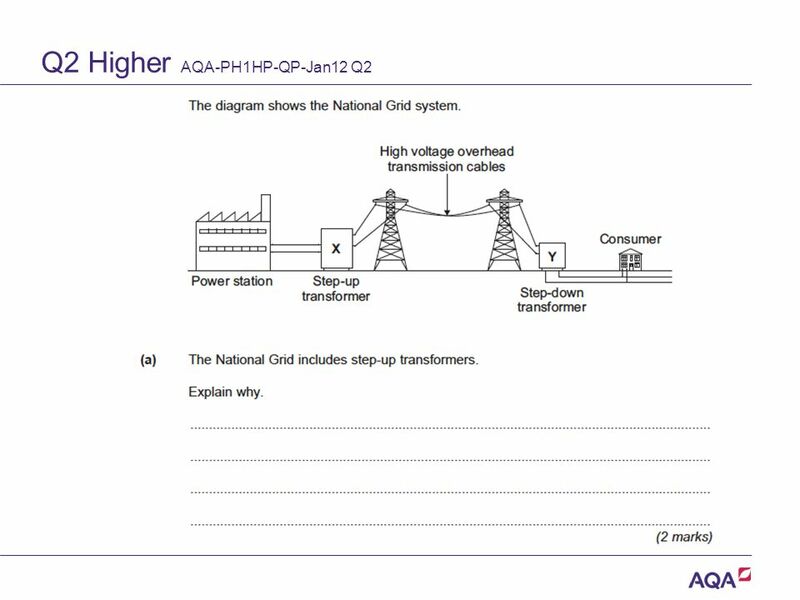 7 Q2 Higher AQA-PH1HP-QP-Jan12 Q2 Version 2.0 Copyright © AQA and its licensors. All rights reserved. 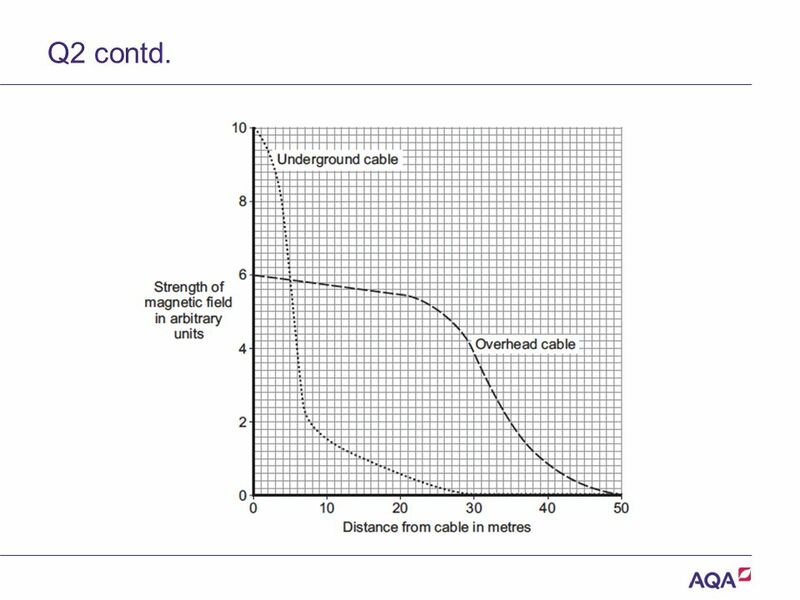 9 Q2 contd. Version 2.0 Copyright © AQA and its licensors. All rights reserved. 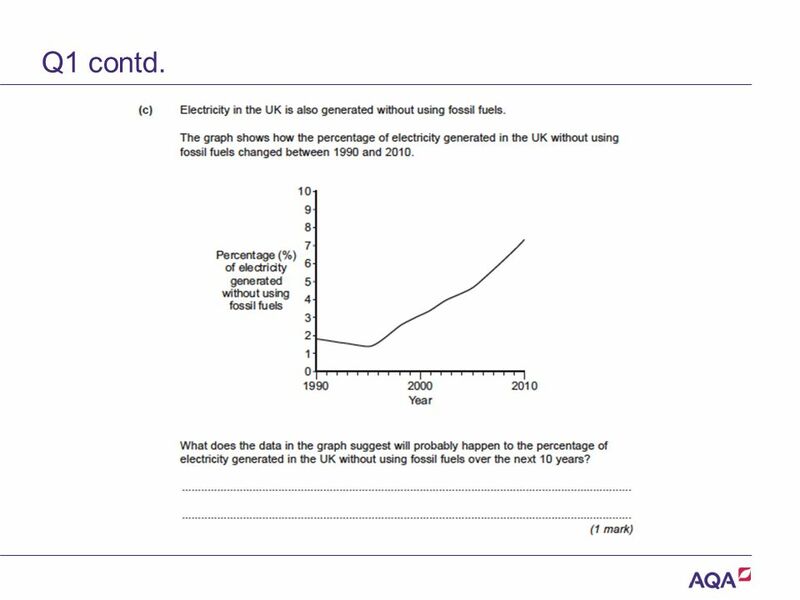 10 Q2 contd. Version 2.0 Copyright © AQA and its licensors. All rights reserved. 11 Q2 contd. Version 2.0 Copyright © AQA and its licensors. All rights reserved. 12 Q2 contd. Version 2.0 Copyright © AQA and its licensors. All rights reserved. 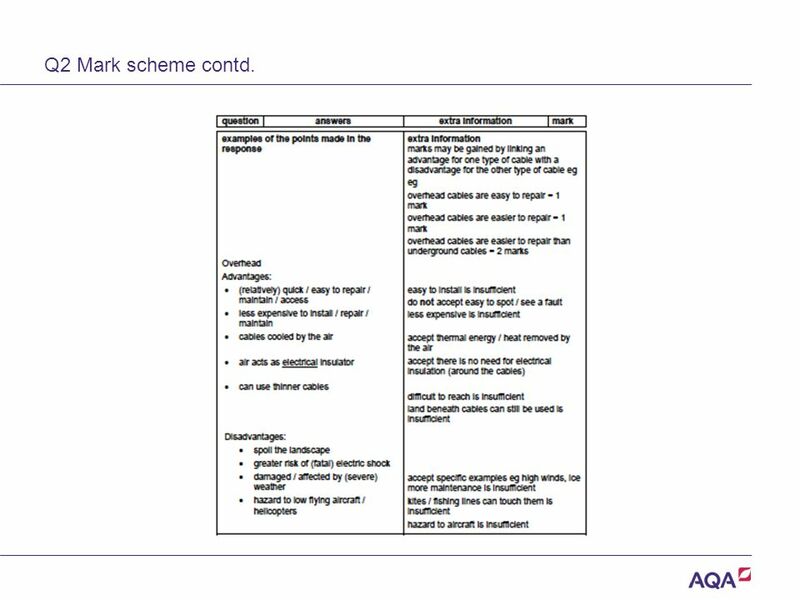 13 Q2 Mark scheme Version 2.0 Copyright © AQA and its licensors. All rights reserved. 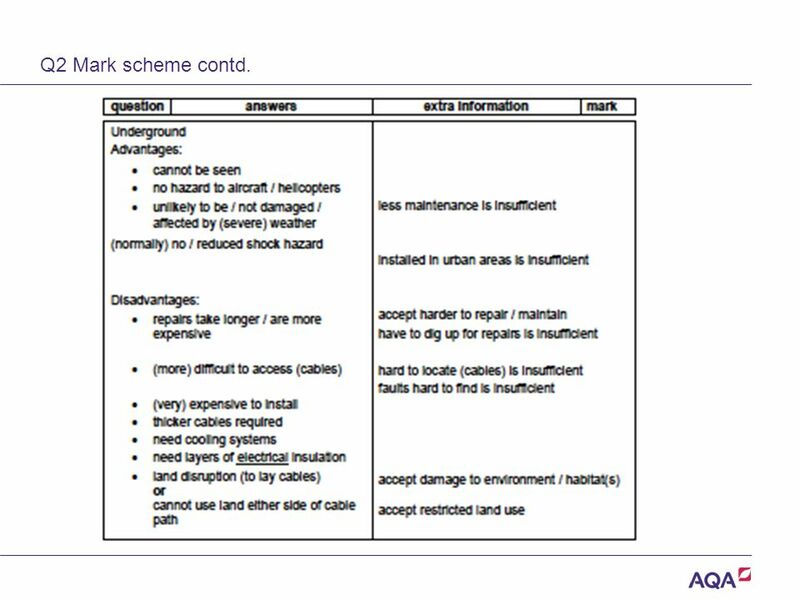 14 Q2 Mark scheme contd. Version 2.0 Copyright © AQA and its licensors. All rights reserved. 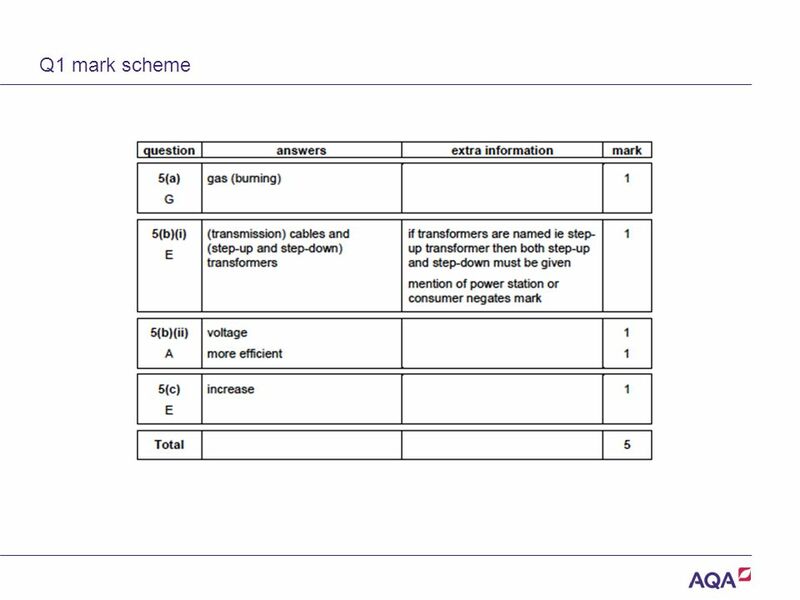 15 Q2 Mark scheme contd. Version 2.0 Copyright © AQA and its licensors. All rights reserved. 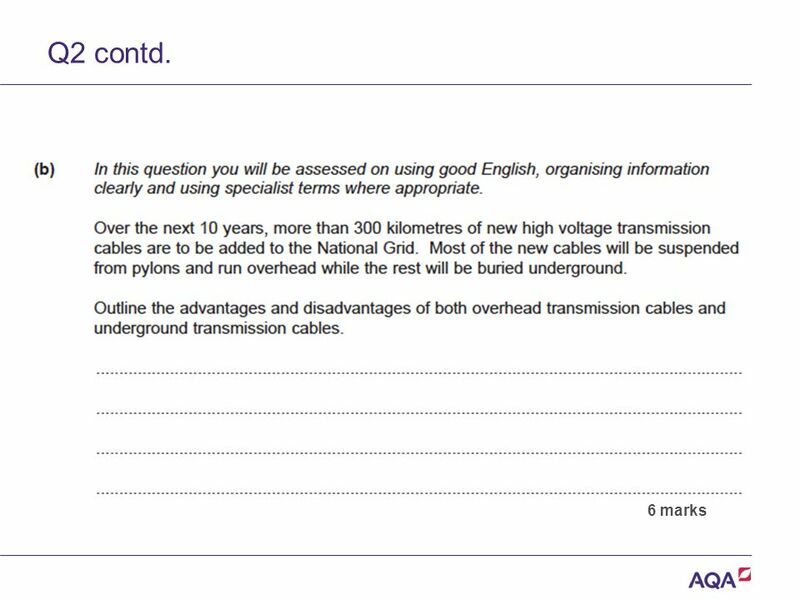 16 Q2 Mark scheme contd. Version 2.0 Copyright © AQA and its licensors. All rights reserved. 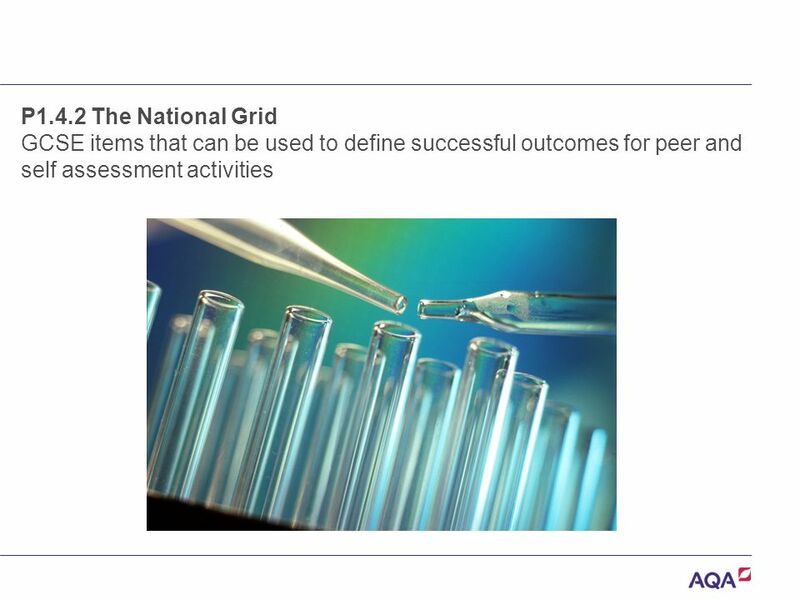 Download ppt "P1.4.2 The National Grid GCSE items that can be used to define successful outcomes for peer and self assessment activities." B1.1 Diet and exercise GCSE items that can be used to define successful outcomes for peer and self assessment activities. Version 2.0 Copyright © AQA and its licensors. All rights reserved. C1.1.1 Atoms. 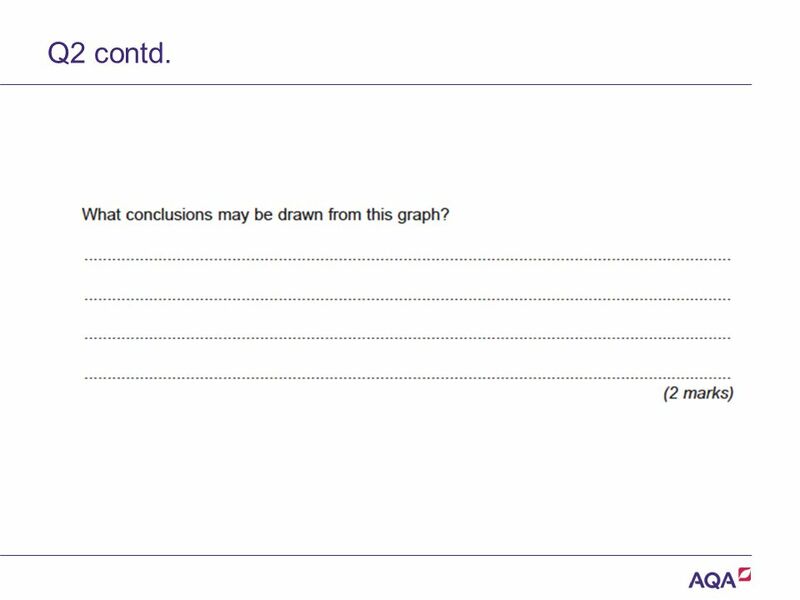 Version 2.0 Copyright © AQA and its licensors. All rights reserved. C (ii) Quantitative Chemistry. 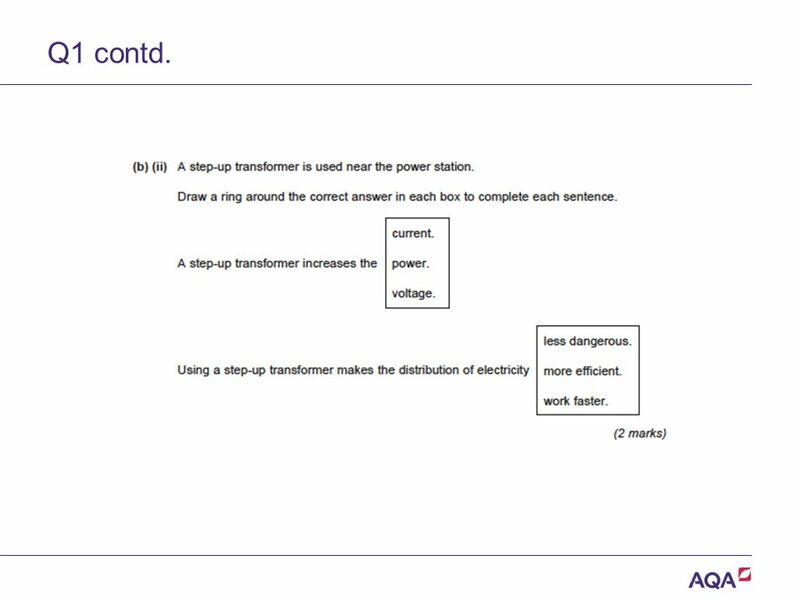 P1.5.3 Sound GCSE items that can be used to define successful outcomes for peer and self assessment activities. P1.1.1 Infrared radiation GCSE items that can be used to define successful outcomes for peer and self assessment activities. Version 2.0 Copyright © AQA and its licensors. All rights reserved. C3 3.5 The production of Ammonia. Version 2.0 Copyright © AQA and its licensors. All rights reserved. C3 3.3 Energy Changes. Version 2.0 Copyright © AQA and its licensors. All rights reserved. C2 2.4 Rates of Reaction. Version 2.0 Copyright © AQA and its licensors. All rights reserved. C1.2.1 Calcium Carbonate. Version 2.0 Copyright © AQA and its licensors. All rights reserved. C1.6.1 Vegetable Oils. 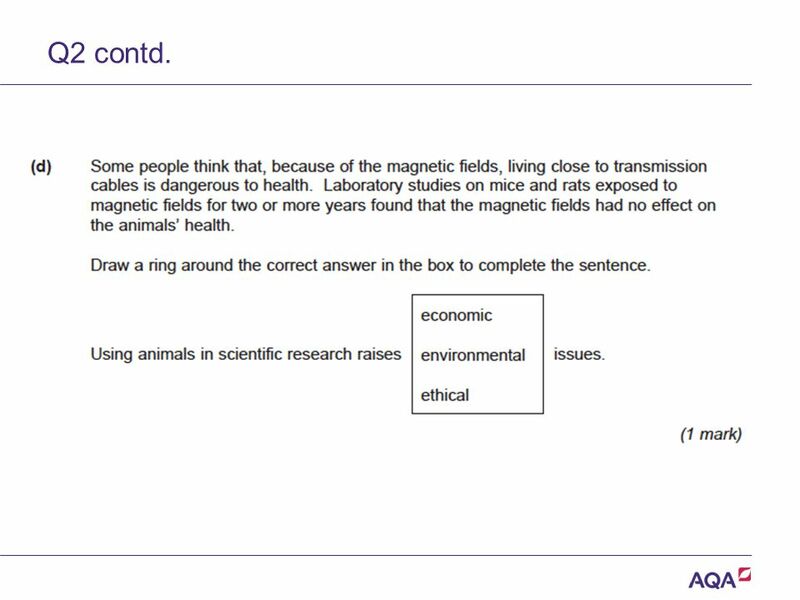 B1.8 Evolution GCSE items that can be used to define successful outcomes for peer and self assessment activities. Version 2.0 Copyright © AQA and its licensors. All rights reserved. B3.1.3 Exchange systems in plants B3.2.3 Transport systems in plants. B3.1.1 Dissolved substances GCSE items that can be used to define successful outcomes for peer and self assessment activities. Version 2.0 Copyright © AQA and its licensors. All rights reserved. C2 1.1 Covalent Bonding.